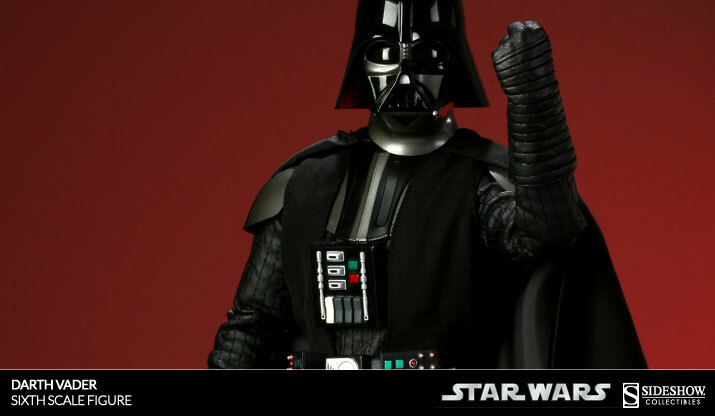 For legions of Star Wars fans across the world, Darth Vader remains the most potent image of what we’ve come to love about that galaxy far, far away. 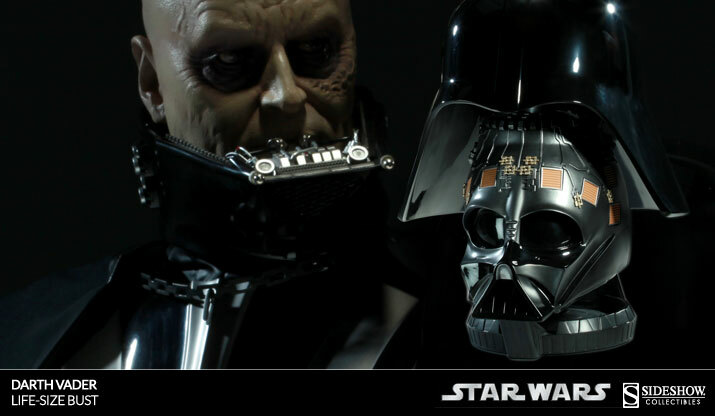 There’s a universal passion at Sideshow for the Dark Lord, as evidenced by numerous Star Wars Darth Vader collectibles our team has created over the past two decades. Whether it’s a fascination with his descent into darkness, or that sense of menace we feel every time he appears on screen, there’s always something about the sinister Sith that makes us want to revisit him again and again. 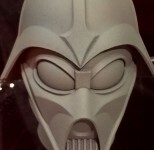 We’re proud to present a retrospective look at Sideshow’s history with the Star Wars icon. Sideshow’s artists went all out to represent his iconic costume and armor with hand painted detailing and multiple fabrics, and included light up features for optimal effect. He displayed magnificently on his own, or with the previously released Obi-wan Kenobi Premium Format™ Figure, to effectively recreate the scene of their final duel. The Sideshow Exclusive addition of the mouse droid accessory provided an extra bit of fun and flair. 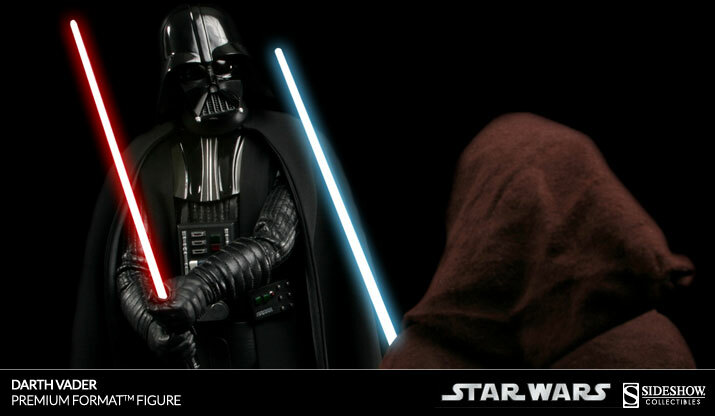 The diorama has been a longtime favorite format for its unique capacity to tell a story, and Sideshow’s Star Wars ‘versus’ dioramas offered collectors some of the most dramatic confrontations from the films – in a reasonable size that could be displayed on a desktop or hung on a wall. 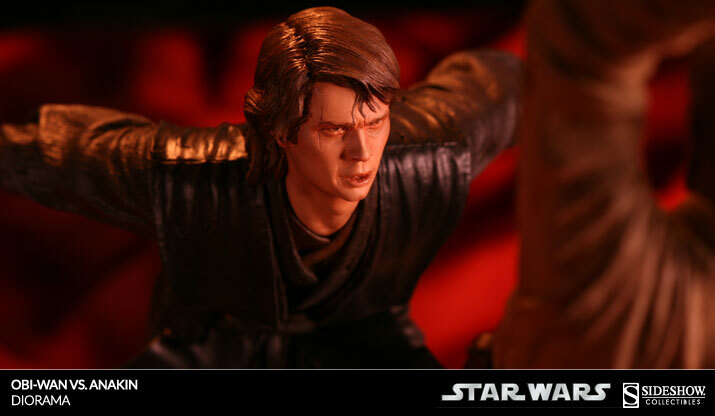 The first of the diorama series, Anakin vs. Obi-wan, captured the climactic duel between friends amidst the fiery environment of Mustafar. While not technically a Darth Vader piece, this pivotal scene represented Anakin’s final steps towards becoming the fearsome cyborg we know and love. Design and execution for this diorama was accomplished with Martin Canale and the Gore Group, coupled with the sculpting finesse of Trevor Grove. Traditional foundry bronze delivers an unmistakable visual and sensory appeal, with its distinctive luster, substantial weight, and cool to the touch feel. It is a medium that we reserve for the most revered heroes and icons. 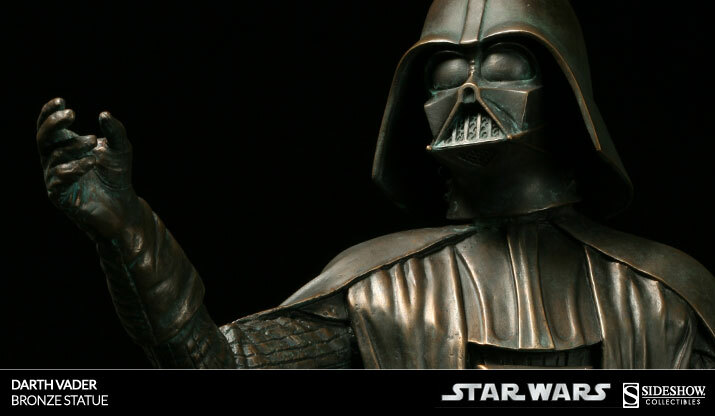 The Darth Vader Bronze Statue captured Vader at his menacing finest, with one arm raised to indicate a force-choke in the making. With a highly limited edition size of only 50 pieces and 5 artists proofs it is a rare find now for Star Wars collectors. 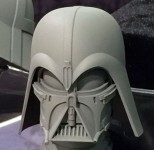 The development of Sideshow’s first Darth Vader Sixth Scale Figure was a collaborative effort. Working with Hot Toys and The Gore Group, the Sixth Scale team engineered a new and unique body type with over 30 points of articulation. 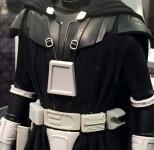 Sixth Scale collectors know the fun is in the accessories, which included multiple hands, lit and unlit lightsabers, a lightsaber belt hook, plus the addition of a “force choke” hand with the Exclusive Edition. 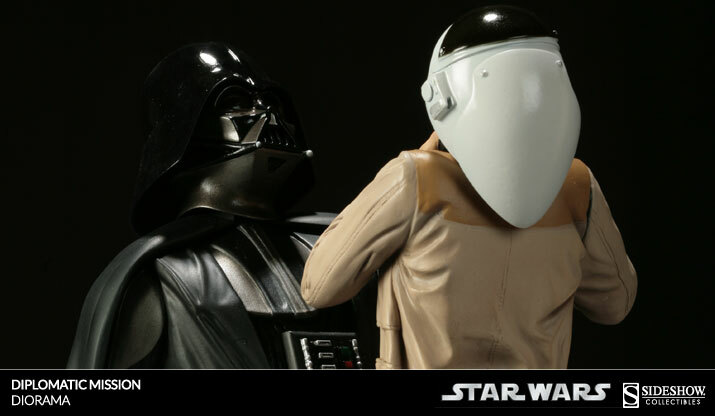 The original Star Wars trilogy begins with an unforgettable demonstration of physical might, when Darth Vader lifts Captain Antilles of the Tantive IV from the deck and crushes the victim’s throat in his fist. On film this memorable feat was accomplished via cinematic trickery and cleverly edited shots. With this diorama Sideshow presented the scene head-to-toe as never seen before, in full 360 degrees. On the molten planet of Mustafar, Anakin Skywalker’s former friend and master, Obi-Wan Kenobi, left him crippled and consumed with hatred. Reborn, as more machine than man, it would be two decades before the two would meet again and Darth Vader would seek his vengeance. 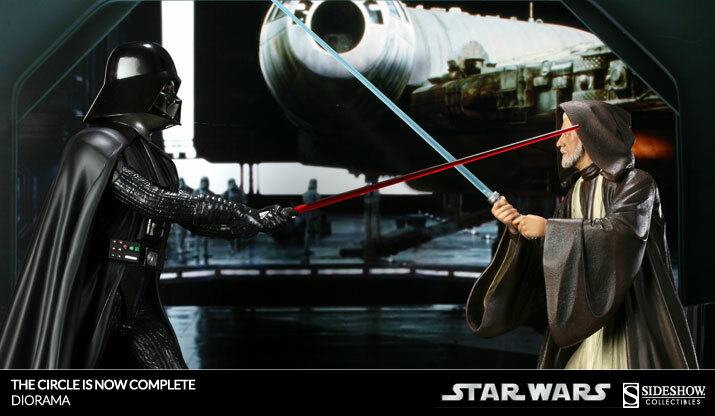 Sideshow’s “The Circle Is Now Complete” Diorama portrays that final confrontation on the Death Star – when Obi-wan, returning at last from exile and rejoining the struggle, went saber-to-saber with Darth Vader for the last time. A full-color backdrop of the hangar bay was included with the Exclusive edition. 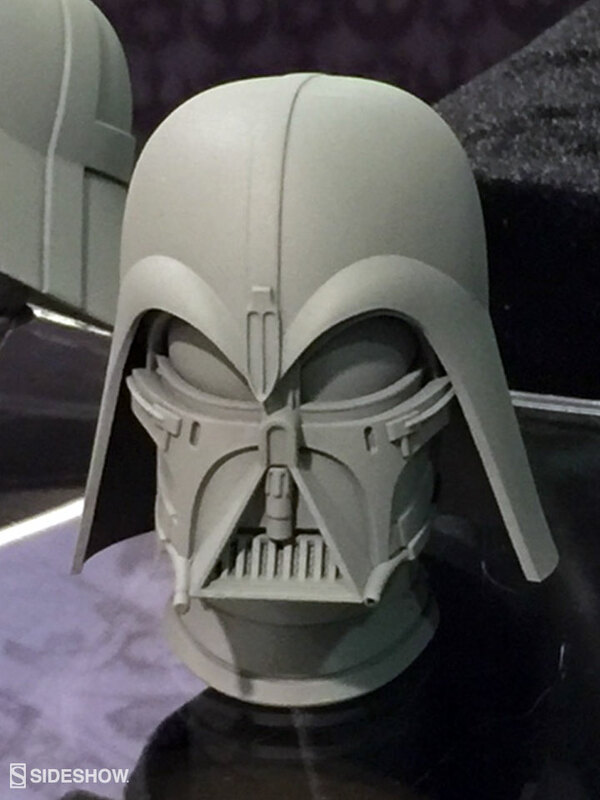 Creating the ideal Darth Vader Life-Size Bust was not an endeavor Sideshow’s art team took lightly, or alone. For this project we partnered up with the talented special effects folks at Spectral Motion. 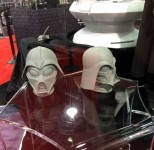 One of the primary goals with this presentation was to allow the viewer to disassemble the mask and see Anakin’s true visage as an alternate display option. But rather than develop a defeated portrait of Anakin Skywalker as he is seen on screen in the Return of the Jedi at the time of his death, our artist’s chose to capture a timeless vision of the fallen Jedi bearing an intense, purposeful expression. In a climactic moment from The Return of the Jedi, Luke falls before the Emperor and Darth Vader is faced with a terrible choice – to continue his commitment to the Dark Side or to save his son. His decision to slay the Emperor and sacrifice himself to save Luke leads to Anakin’s redemption, further illustrated near the end of the film, when Anakin’s spirit appears next to those of his former teachers. 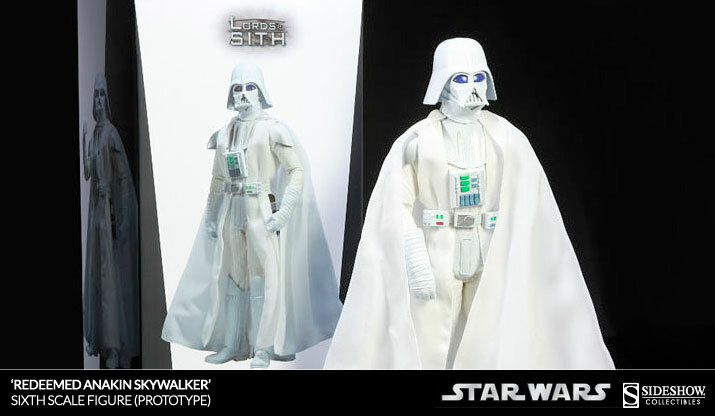 The initial concept behind this Sixth Scale figure was to provide collectors with a redeemed Anakin Skywalker, dressed in a ghostly “Force Spirit” white version of Darth Vader’s armor. 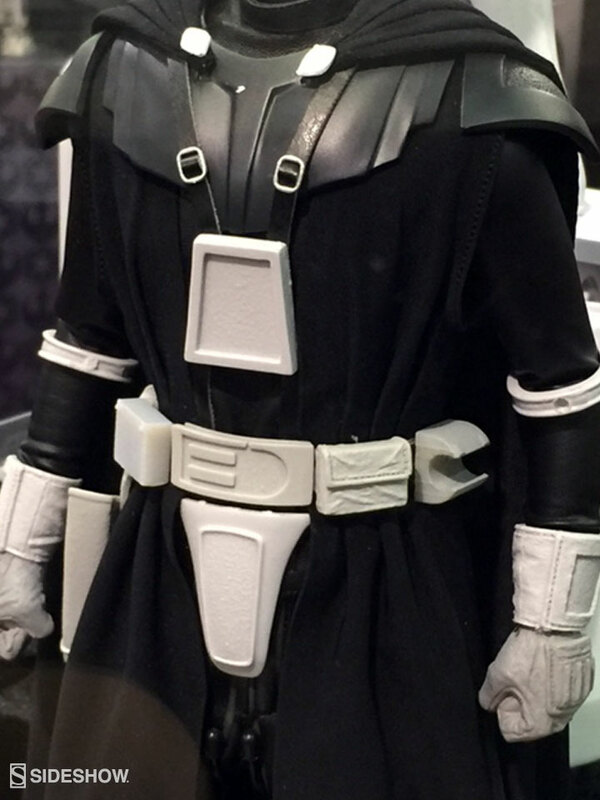 However, as Vader’s armor itself is ultimately a symbol of the Dark Side, it was decided that the figure was too much of a contradiction. Instead of seeing the figure through production, we chose to auction this one-of-a-kind prototype in 2011 for a holiday charity benefit. It sold for over $4,000! In The Empire Strikes Back, young Luke Skywalker is lured into a lightsaber duel with Darth Vader, only to find that his skills are no match for the Dark Side of the Force. Darth Vader pummels Luke until, battered and dismembered, he crawls onto a gantry in defeat. It is there, with nowhere to retreat and a yawning shaft descending below, that our struggling hero discovers a terrible truth. 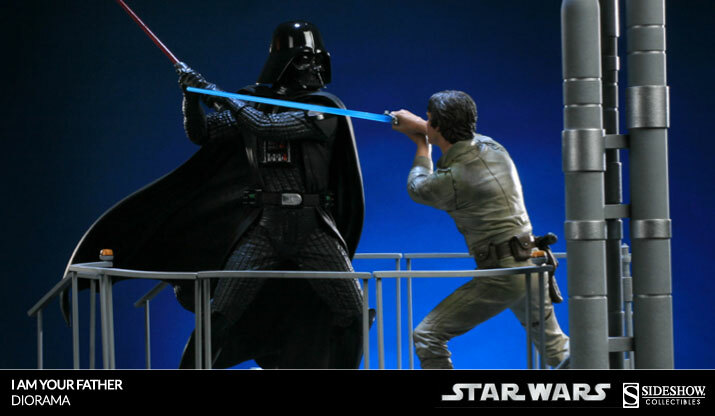 Sideshow’s “I Am Your Father” Diorama captured this fateful duel between father and son, and arguably the biggest reveal of the entire saga. 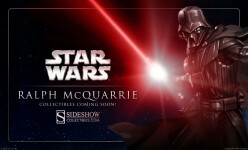 As part of the new Star Wars Mythos series featuring original interpretations of new and favorite characters, Sideshow’s team took Darth Vader back to the place of his origin. 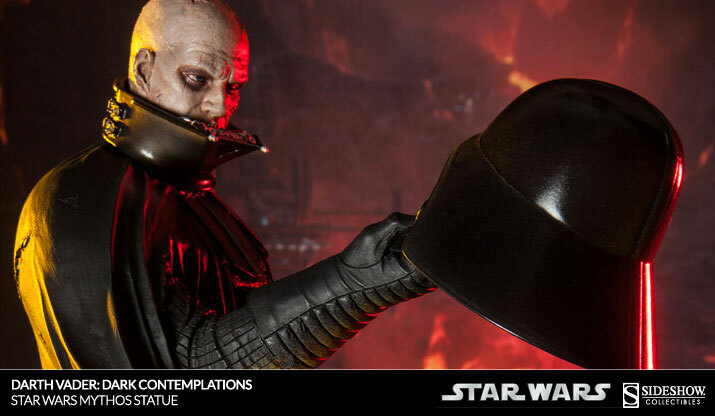 The Darth Vader Mythos: Dark Contemplation statue paints a portrait of internal conflict and resolve. 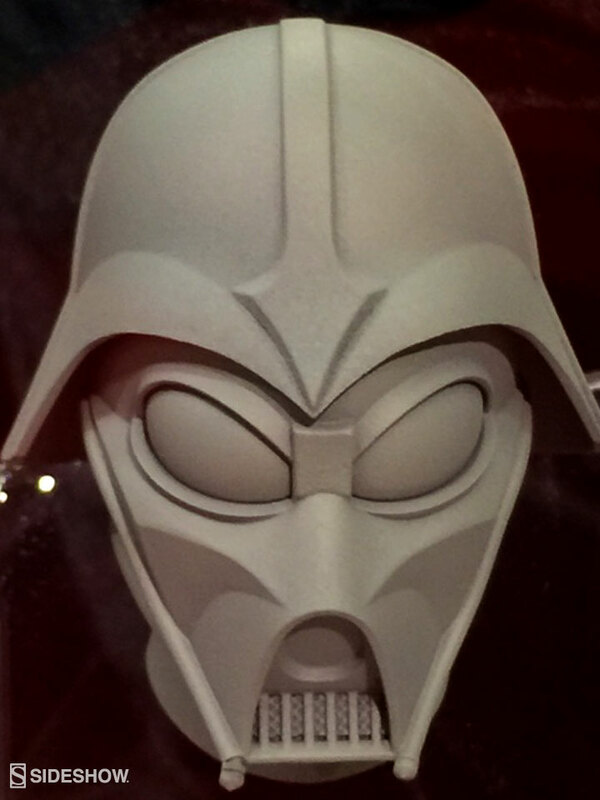 The heat and flames of that volcanic planet steel the resolve of Lord Vader as he considers the rage and loss contained by the fearsome mask in his hand. Three portraits, and an equal number of interchangeable arms allow the collector to capture the moment in a variety of ways. 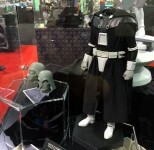 Sideshow was proud to celebrate the 30th anniversary of Return of the Jedi with the release of an all-new Darth Vader Deluxe Sixth Scale Figure. 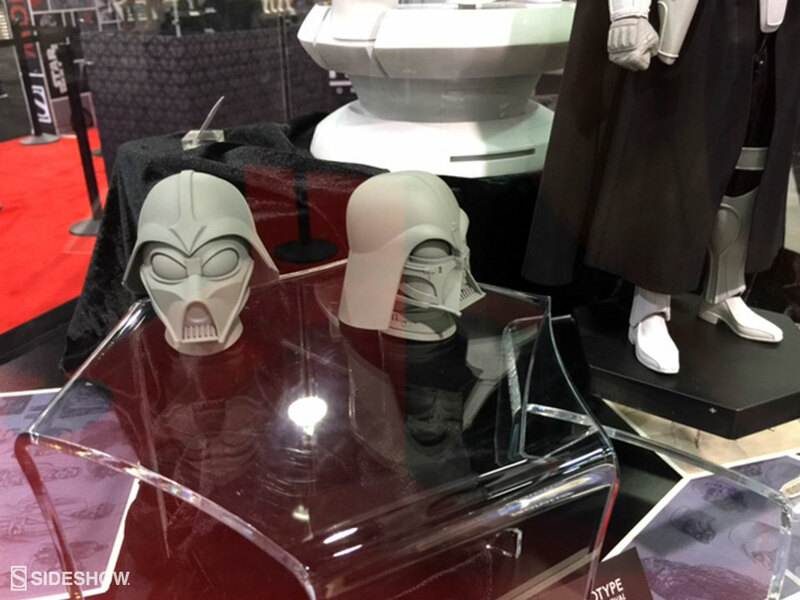 In addition to a redesigned body and helmet, collectors found astonishing detail inside the helmet, offering multiple versions of the mask for a wide range of display options. 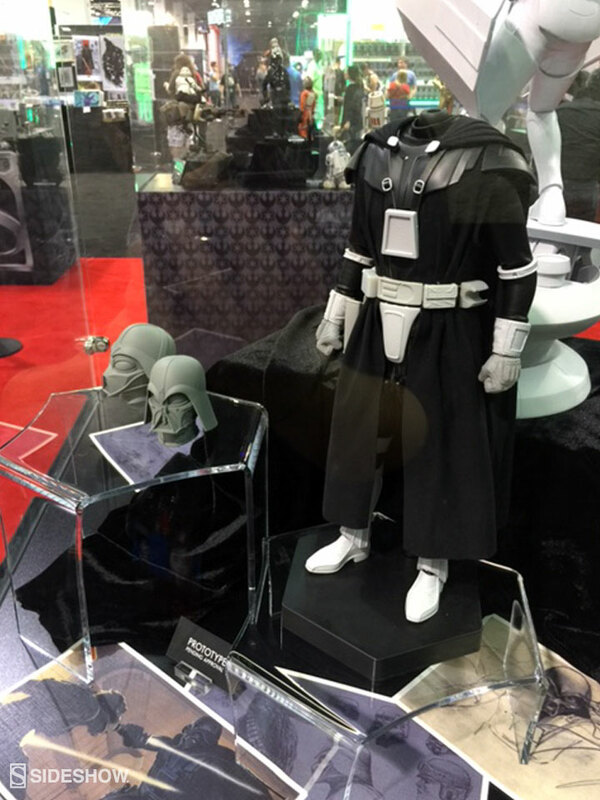 The Deluxe Figure also includes a meditation chamber stand and special Imperial themed base with light-up features. 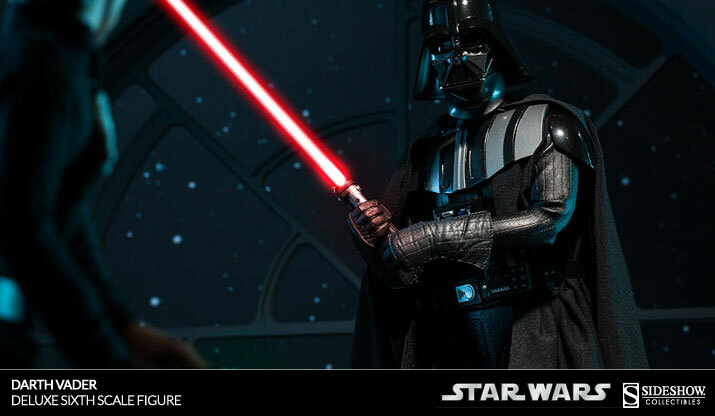 Ruthless and powerful, Darth Vader stands at the height of his power with Sideshow’s Darth Vader Lord of the Sith Premium Format Figure from Star Wars Episode VI: Return of the Jedi. Inspired by one of the most climactic duels in cinematic history, the Sith Lord descends the steps of a Death Star themed base. With his light-up crimson lightsaber at the ready, the commanding villain is prepared to engage in mortal combat and claim victory for the Galactic Empire. 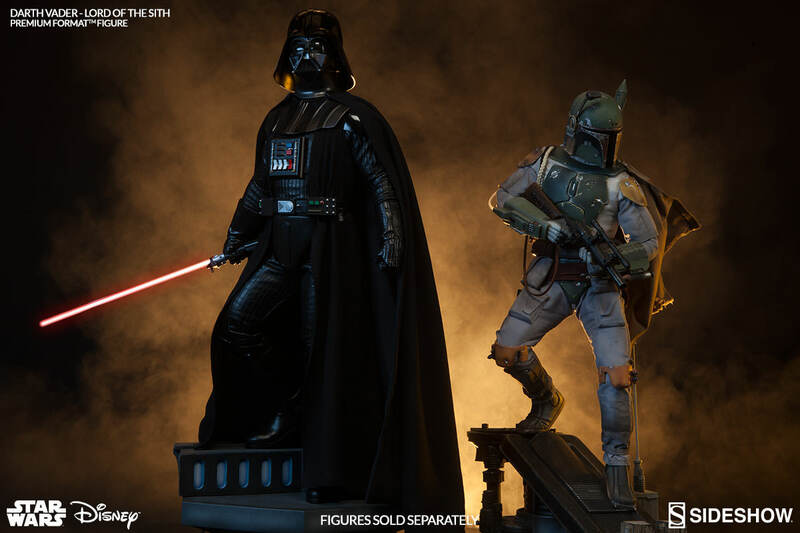 The height and composition of this impressive piece make it an ideal companion to Sideshow’s Boba Fett Premium Format Figure, and the perfect centerpiece of any Star Wars collection.